Just thinking about a family getaway high up in the mountains makes you relax. Surrounded by forest and the fragrant smell of pines and spruce, America’s finest mountain resorts are therapeutic retreats for active families. In winter, you can ski or snowshoe, and come summer, it’s time to hike, bike, canoe, fish and go horseback riding. Or, you can simply relax. There’s no better place to leave the stresses of everyday life behind than these mountain family resorts. Walk out the back patio of The Sagamore and glance past the manicured lawn to the waters of Lake George. You'll quickly understand why this is the premiere address in the Adirondacks. On the opposite shores of this long rambling lake, which often resembles a river, is an uninterrupted carpet of trees that rise to the top of 2,000-foot mountains. The waves of rolling summits form a silhouette against the sky that, due to the lake's narrow width, hems you in snugly between the peaks. Set on a 70-acre island near Bolton Landing, this large wedding cake of a hotel has been keeping families happy for well over a century. The white clapboard resort overlooks the aptly named Dome Island and takes advantage of this beauty strip to offer swimming, boating, parasailing, banana boat rides, fishing, a fitness center with aerobics classes and yoga, indoor and outdoor tennis courts, summer camps for the kids, and an outdoor pool and hot tub. Take a cruise on the Sagamore's private launch, the Morgan, to visit the more pristine inlets and islands in the northern half of the lake. Or better yet, go for a sail with the resort's sailing school. You can also rent kayaks to paddle around the island. Kids will like the outdoor movies in summer and the cafe downstairs. Even if you decide not to stay here, do yourself a favor and walk the exquisite grounds. It was 1892 when a young employee for the Canadian Pacific Railroad named Thomas Wilson came upon a gem of lake in the Canadian Rockies that sat beneath a towering glacier. He would write in his journal: "As God is my judge, I never in all my explorations saw such a matchless scene." Taking his recommendation, Canadian Pacific would build a one-story log cabin that would serve as a hotel for guests who savored the outdoors. By 1912, word spread about this majestic spot in the mountains, enticing more than 50,000 people to reach the shores of Lake Louise. It was time for Canadian Pacific to build a grand chateau with blue roofs and turrets, furnishing it with the finest craftsmanship of the Edwardian era, so visiting royalty, heads of state and celebrities could hobnob in comfort. Today, the Fairmont Chateau Lake Louise is still considered a gem in the Canadian Rockies. Yet, even if this lofty lodging was still a log cabin, you'd want to come here to experience the glorious vista of this emerald lake surrounded by snow-capped peaks. Grab a canoe from the hotel and cruise across this 1.5-mile-long glacial cirque. However, you might think twice about going for a dip. The water temperature never gets higher than 39 degrees Fahrenheit! Families can also enjoy an indoor heated pool, sleigh rides and ice-skating, plus guided hikes during the summer months. Home of the 2010 Winter Olympics, Whistler has many upscale accommodations like the Fairmont and Westin. Yet, one step inside the limestone and granite lobby of the Four Seasons Resort Whistler and you've been transported to a state of relaxation, where your every whim seems to be taken care of with ease. In winter, the resort will have your waxed skis and pre-warmed boots waiting at the hotel's Ski Concierge Shop at the base of Blackcomb each morning. It also features a Ski Elite Program with one-on-one instruction for skiers and a concierge that works solely with teenagers. The hotel is also conveniently a 15-minute walk to all the restaurants and shops in the center of town. During the summer, Whistler is known for its abundance of outdoor adventure, from zip-lining on the longest run in North America to heli-hiking on untrammeled Coast Mountain alpine meadows and biking down the mountains. For something a bit more relaxed, canoe the River of Golden Dreams. Following the current that flows from the eastern end of Alta Lake, you're soon cruising through the pines, with Whistler Mountain standing tall in the backdrop. The Omni Homestead Resort - Hot Springs, Va. The healing Hot Springs water has been soothing visitors since the time of the Revolutionary War. Many of our founding fathers, including Thomas Jefferson, have taken a soak in this Allegheny Mountain outpost on the Virginia-West Virginia border. A century after Jefferson, in 1902, The Omni Homestead Resort was built to house the many visitors making the pilgrimage. And what a house she is! This grande dame, built of red Kentucky brick and limestone, is the finest Virginian country manor open to the public. This resort is spread across 15,000 acres that feature three golf courses, tennis courts, horseback riding, hiking, fishing, biking, downhill and cross-country skiing, ice-skating, bowling and spring-fed indoor and outdoor pools. If you think the mega-resort solely caters to conferences, head straight to the KidSpa, where the 8-and-over sect can soak their toes in chocolate milk and fingers in strawberries and cream, learn how to apply make-up, and get a facial or even a Swedish massage. The year-round kids' club for ages 3 to 12 keeps the youngsters busy with outdoor activities, arts and crafts, and -- this being western Virginia -- some good old tales about the mountains. If you and the family really want that Rocky Mountain High, it's hard to top The Broadmoor, set at the base of Cheyenne Mountain on the outskirts of Colorado Springs in the Rockies. Opened in 1918, this classic manor has kept up with the times, opening one- to eight-bedroom cottages that are perfect for an extended family reunion. Most of the action centers on Cheyenne Lake with its infinity swimming pool, children's pool, waterslides and Whirlpools. There are also three 18-hole golf courses, tennis courts, paddle boating on the lake, bike rentals, horseback riding through the wilderness, and off-property tours to fly-fish, whitewater raft or ride a cog train up Pike's Peak. From Memorial Day to Labor Day, Bee Bunch offers children ages 3 to 12 full-day, half-day and evening sessions to join counselors on hikes and scavenger hunts, as well as an option to enjoy the Junior Ice Cream Manicure and Pedicure at the spa, geared toward children ages 11 and under. Jenny Lake Lodge - Moose, Wyo. Rustic elegance is the only way to describe the 37 cabins that surround a meadow of wildflowers at Jenny Lake Lodge. Arguably the finest property in any of America's national parks, walk out that cabin door and you'll be peering up at the serrated ridge of the mighty Tetons. Take a hike through the tall pines and you'll no doubt spot elk, bison and antelope. There are glacial-fed lakes for boating, fishing and swimming, and befitting Jenny Lake's history as a former dude ranch, you can go horseback riding as much as you want. Riding is included in the price of the cabin, along with bike rentals, breakfast and dinner. And these are no ordinary meals -- the kids will rave about the fresh mountain berries in the pancakes and mom and dad will go gaga over the five-course dinner that often includes buffalo carpaccio, wild trout and tender chunks of veal, along with a superb wine list. It's good to know you won't have to drive that evening. Just look up at the stars and pat yourself on the back for booking a stay at this legendary lodge. 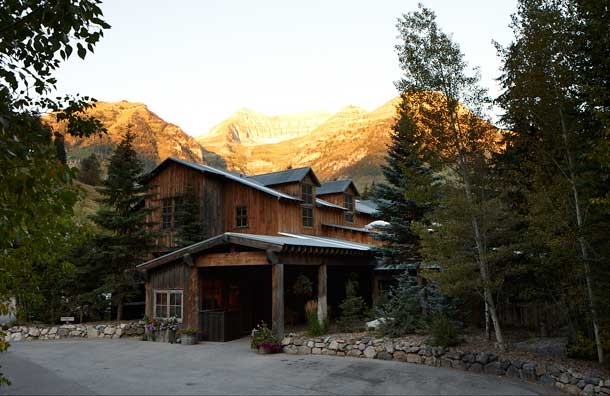 When actor Robert Redford purchased land in 1969 and began building Sundance Resort, he chose a magical locale on the eastern slopes of 11,750-foot Mount Timpanogos. Then he built cottages from indigenous woods and stone and placed them along streams and under groves of aspen. Today, Sundance is a four-season playground for families. In winter, Sundance is a great place to learn to ski with countless trails on both the front and back of the peak. There are also more than 20 miles of groomed cross-country trails to leave you deep in the forest. Summer and fall can be even more fun, with the lifts still running to bring hikers and mountain bikers to the peak. The Sundance Nature Trail snakes through the oak, maple and spruce to reach a waterfall. Then there's the arduous Great Western Trail, which climbs an unrelenting 4,000 feet to reward you with some of the most breathtaking vistas in the West. There's also ample opportunity to fly-fish for trout on the nearby Provo River and go on guided horseback rides from Sundance Stables. Back at the resort, there's a spa to rest your weary muscles, art classes offered at the Art Shack Studios, and gourmet fare found at the restaurant. The Majestic Yosmite Hotel - Yosemite National Park, Calif. Built of heavy timber and stone in 1927, The Majestic Yosemite Hotel (formerly The Ahwahnee) has one of the most coveted addresses of any hotel in America: Yosemite National Park. Surprisingly, the historic lodge is at its finest in winter when you can return from a day of downhill skiing at Yosemite Ski & Snowboard Area or skating at Curry Village to relax by the massive fireplace in the hotel's Great Lounge and feel as cozy as John Muir. Book far in advance for a room in the high peak summer season, then wander outside to see sheer walls of the silvery Half Dome plunge some 4,500 feet below. Or walk amidst the 200-foot sequoia trees in Yosemite's Mariposa Grove. The hotel features a large outdoor swimming pool, tennis courts, a gorgeous dining room open for all meals (and including kids' menus), and nightly talks by park rangers in the summer. Be sure to take a free, historic walking tour of the property, too. The hills are alive with the sound of happy families hiking, biking and skiing in Stowe, Vermont. Maria von Trapp, the woman who inspired "The Sound of Music," is no longer with us, and the original building burned down in 1980, but the Trapp Family Lodge endures. Set on a crest overlooking the Green Mountains, the new Austrian-style lodge has the same ole' stunning view. Members of the Trapp family are still found dining on wiener schnitzel and apple strudel with guests and leading sing-alongs in the living room. But it's the outdoors that beckon families. The 2,600-acre resort is hidden in a fertile valley, ringed by mountains, providing splendid walks through dense woods past working sugarhouses, such as the 6-mile round-trip stroll to Slayton Pasture Cabin. Maria's grandson, Sam, carved stellar mountain biking trails out of the woods and offers lessons. The resort is also wonderful in the winter and spring months. Three years after the debut of "The Sound of Music," Sam's dad opened one of the first (and still one of the best) commercial cross-country ski centers in North America. When the maples start to thaw in the spring, it's time to tap the maple syrup. Join in on the fun each Saturday, when you can cross-country ski, snowshoe or grab a horse-drawn sleigh to the sugarhouse for a traditional Sugar-on-Snow party. Resort at Squaw Creek - Lake Tahoe, Calif. 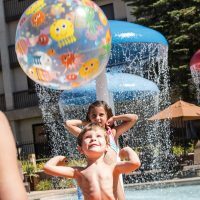 There's something for everyone at the Resort at Squaw Creek in Lake Tahoe. Located at the base of Squaw Valley and home of the 1960 Winter Olympics, this resort boasts endless activities for the whole family to enjoy, including skiing, ice-skating, sledding, tennis, golf, fly fishing and much more. Parents can treat themselves to a day at the spa while kids hang out at the arcade or partake in Mountain Buddies -- a supervised program for kids ages 4 to 12 that offers a plethora of activities for them to enjoy, including biking, hiking, arts and crafts and more. At the end of the day, retire to your luxurious accommodations and enjoy a much-needed and deserved night of sleep.